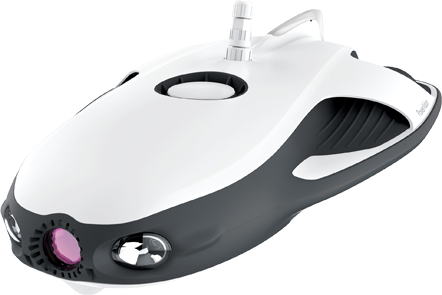 The PowerRay is the world’s first affordable versatile underwater drone available on the the market! 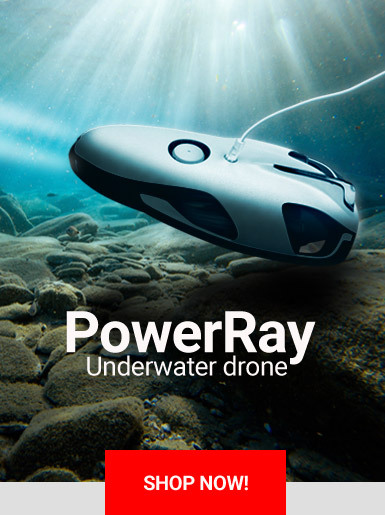 With the PowerRay you can film, photograph and explore seas, oceans, rivers and lakes. Open the box, quick-charge the battery, download the app and activate your drone: you’re ready for the big splash. 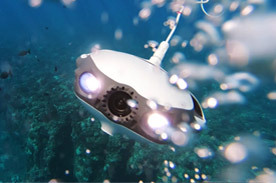 The 30-meter depth-resistant shell of this drone is filled with the latest ROV-technology available: 4K UHD-ready camera with real-time colour correction/white balance control via our dedicated app, 12 million pixels sensor with 1600 iso sensitivity, 2 m/s diving speed, up to an incredible 4 hours of diving autonomy, and of course real-time footage transmitted on your phone/tablet/phablet. "The PowerRay elevates your photography to a new level"
Best in its class! 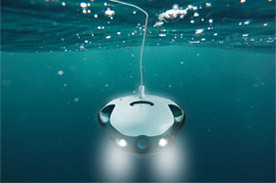 Dive up to 4 hours with one single battery charge. Plenty of time to film, photograph and explore! PowerEgg / a lovely drone for the family! With their aggressive profiles and their whirring, going-at-war styles, quadcopter drones can be a bit scary. This is why we created the PowerEgg, a unique drone by its shape and its features! Under its multi-awarded, uniquely designed hood, the PowerEgg hides impressive specs: It’s is the only of its class to offer a true 360° rotating camera in 4K-UHD at 12 million pixels. The PowerEgg lets you focus on what matters the most: recording images. Its easy and intuitive motion control system coupled with a super accurate GPS-tracking gives you a total freedom of movements. 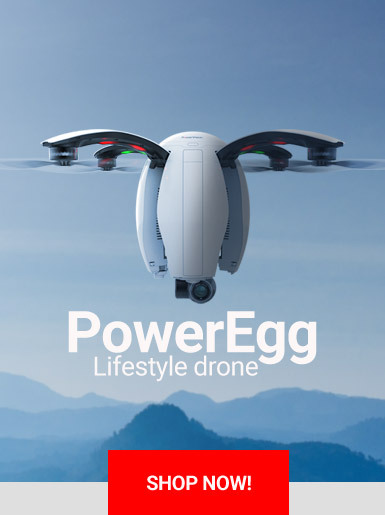 Even if you’re not an expert, drone-flying is a no-brainer with the PowerEgg! 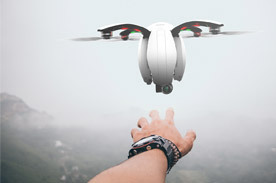 "The PowerEgg is not your ordinary quadcopter"
Take breathtaking footage: the PowerEgg camera allows you to film in 4K-UHD and control the resolution in real-time. Our 12 million pixel sensor grasps every detail, bringing depth and colour richness to your footage! The PowerEgg flies up to 23 minutes. For more safety, you get real-time, accurate info on the remaining filght time. With the one-touch functions, just press a button to land, take off and bring back home your PowerEgg. 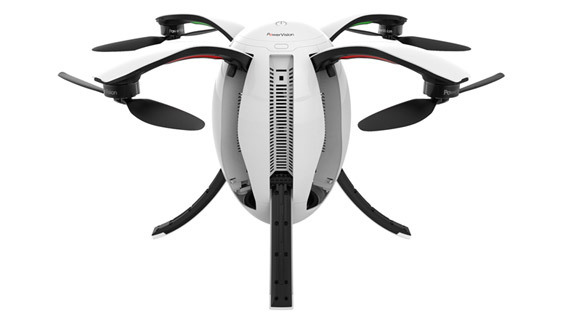 The PowerEgg is the only drone in its class to have a true 360°rotating camera for unstitched panoramas! The 3-axis gimbal coupled with our active algorithm give the PowerEgg an unparalleled stability, even in the wind. And it’s a gem for filmmakers and photographers! The PowerEye has a dual-camera mode /FPV/SMV) accessible mid-flight, with a MFT-mount that makes it compatible with a wide range of lenses. 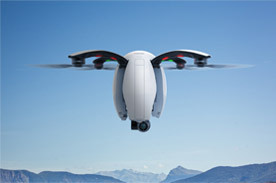 Optionally, the drone can be equipped with a thermal camera. 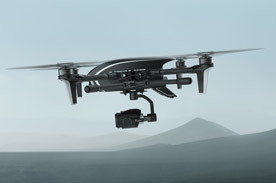 The super-stable 3-axis gimbal insures vibrationless footage under all conditions, and the 4/3" CMOS sensor with a 4640x3480 max resolution records images in 4K-UHD at 24 fps or 30 fps with a sensitivity up to 3200 iso for videos. 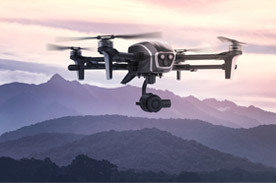 "A professional cinematography drone with an utter mountain of goodies"
The PowerEye has a full 4K-UHD camera coupled with one of the best available CMOS 4/3" sensor! 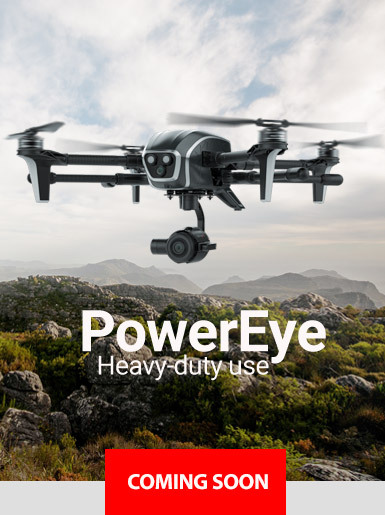 The PowerEye has an industry-leading flight time of 29.5 minutes, one of the most efficient of its class. The fully customisable, open SDK-based payload station allows you to carry & drop up to 2 kilos of cargo. The PowerEye is 100% customisable according to your needs. Click on the button below for our spec list!